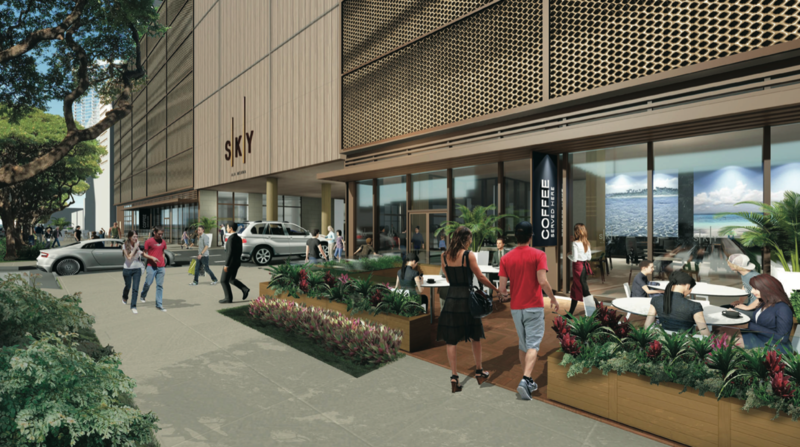 Sky Ala Moana, Avalon Group’s newest project will be located at 1400 Kapiolani Boulevard – currently the Kenrock Building. Some current tenants at this complex include Friend Cafe, Salon Picasso, Twilight Bar & Grill, and Shishin Shiatsu. This project’s prime location in the Ala Moana area will allow a resident to walk to Ala Moana Shopping Center, restaurants, stores, and the future Ala Moana rail station. The project will have a mix of residential and condo hotel units. Sky Ala Moana is projected to have two towers – a 43-story residential and a 37-story condo-hotel tower. The residential tower will have roughly 389 units comprised of one and two bedrooms and the condo hotel tower will have about 300 units comprised of studios and one bedrooms. The developer is partnering with architectural firm Design Partners Inc to work on the design and layout of the units and Philpotts for interior design and finishes. There will be an affordable component in the project. The residential tower will have all market units and the condo-hotel tower will have several floors designated as affordable units. There will be resort style amenity deck which will stretch between the two towers. Sales are projected to start in the fourth quarter of 2018. Contact us if you would like to be on our list to receive updates on this project.